Guitar lessons in Tyne and Wear - Fun, Friendly, Affordable! We offer guitar lessons for classical, acoustic, electric and bass guitar, so whatever style of guitar-playing you’re after, we can help. Classes are available for both children and adults, and all levels of ability are welcome. Looking for lessons for a younger Student? We’d maybe suggest starting off with ukulele lessons, which is a great way to get children into playing music and all of the skills gained are transferable to guitar when the Student is a little older. Students are encouraged to sit guitar exams when they reach a suitable standard but they’re not compulsory. 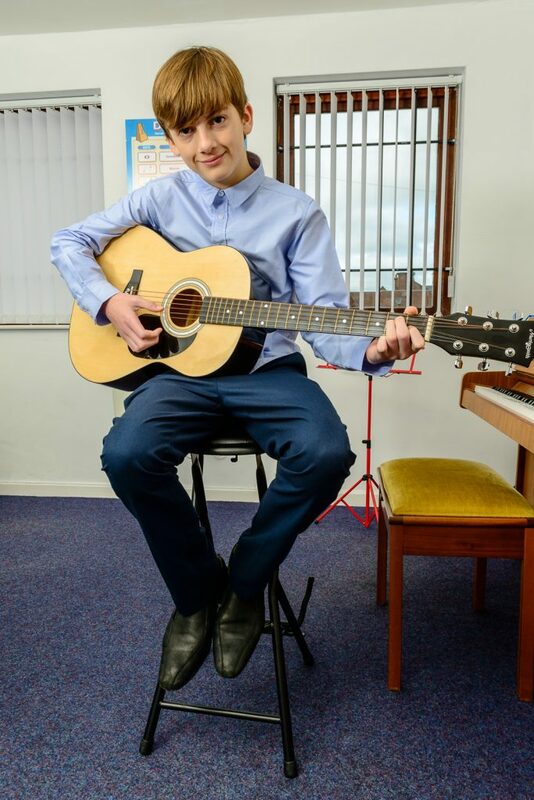 We use 3 different exam boards for guitar exams at Sweet Symphony – Trinity, Rock & Pop and RGT. This enables us to find the best-suited syllabus for each of our Students depending on their style of playing. Do you teach adults as well as children? Yes! All ages are welcome to attend our lessons. We have adult guitar lessons running throughout the week, from absolutely beginners through to advanced players so don’t worry, we’ll find the perfect class for you. Do I need to bring along my own instrument? We do have a few guitars in the Studio which can be used in case you forget yours or if you’d prefer to have a few lessons before buying an instrument. But generally we’d say it’s best for you to bring along your own instrument. At which age can my child start guitar lessons? We do have children as young as 5 years old in our guitar lessons (provided they have a suitably-sized guitar), but usually we’d say 5-6 year-olds would be better starting with ukulele lessons first as they’re much easier for small hands to play! For more information on our ukulele lessons, please click here. I’m a left-handed player: can you still teach me? Yes! We can teach both left- and right-handed guitar players, don’t worry! Can you help me restring my guitar? Yes, your teacher can show you how to restring your guitar so you can manage it easily in the future. If you need new strings, we also have supplies within the Studio which you can buy.